TCA CROSS stands for The Chemical Reconstruction Of Skin Scars with TriChlorAcetic Acid It is a very versatile tool that can effectively treat icepick scars, boxcar scars and enlarged pores. Typically the deeper the scar (or the larger the pores), the better the result. TCA for these purposes can be used in concentrations from 70-100% depending on your skin type and the depth of your scars. How long has TCA CROSS been around? TCA CROSS has been the gold standard for the treatment of deep atrophic scars for more than ten years. Consultation and physical examination to establish suitability is imperative. The treatment is very well tolerated and does not require topical anaesthesia. The skin is thoroughly cleaned and then a small amount of TCA is deposited into the base and along the interior of the scar/pore with an applicator. This causes a localized inflammatory reaction resulting in collagen remodeling, as well as, the formation of new collagen fibers. The result is the improved appearance of scars and pores. Improvement can be seen after just 1 treatment of TCA CROSS, however depending on the depth of your scars 2-3 treatments, 6-8 weeks apart, may be required. Patients with acne scarring usually have a combination of rolling, icepick, boxcar and tethered scars and a combination of treatment modalities invariably delivers the best results. As a rule of thumb, the deepest scars should be addressed first and once suitably improved an Erbium laser can be used over the entire affected area as a final blending and smoothing measure. In the instance of pore reduction, 2-3 treatments are typically required to reduce pore size by 50%. The results achieved after a TCA CROSS treatment are permanent and no maintenance regime is required, nonetheless, results can be optimized by the use of topical Vitamin A cream. TCA is a self-neutralizing peel and once the “frosting” or whitening of the treated area is visualized the process is complete. The treated areas can remain white for 3-9 hours after treatment. We then apply an antiseptic emollient followed by sunscreen and concealer, if required. Following the initial period the white spots turn red for approximately 3-4 days before they shed away. Complete recovery is usually at 5-7 days, however slight redness may persist up to 2 weeks. The face can be cleaned using non-soap cleansers and moisturizer as usual. 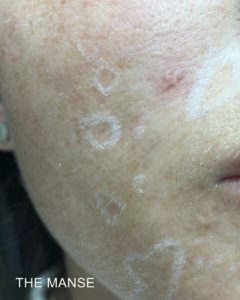 Vitamin A cream can be resumed once the redness has settled. How can I enhance my result? Prolonged redness of treated areas. Post-inflammatory hyperpigmentation (usually transient) or rarely permanent hypopigmentation. Damage to mucosal surfaces if accidental contact with eye, lip or nostril. Initial sun avoidance and daily application of sunscreen minimizes the risk of complications.